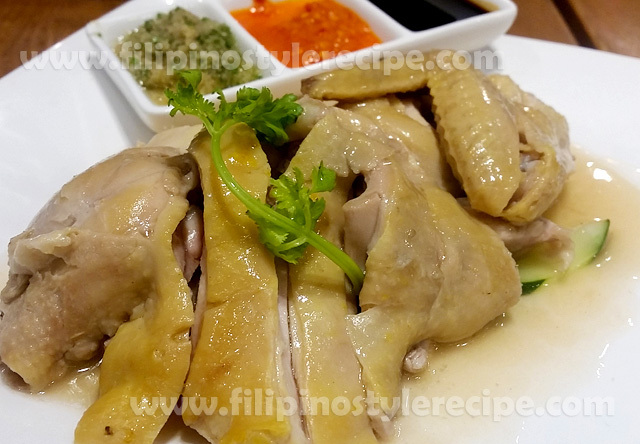 Filipino style hainanese chicken recipe is popular among chi. It is mainly made up of marinade fish then steamed until done. 4. When the chicken is done, remove from heat and stand for 30 minutes. Reserved the chicken broth. 1. In pan, heat margarine and saute garlic and onion. Add washed rice and continue sauteing for 5 minutes. 2. Transfer the rice to rice cooker and add chicken broth. Continue cooking until rice is done. 1. In a blender, place ginger, coriander and olive oil. Pulse until a paste like mixture is formed. 2. Debone the chicken and transfer to serving plate. Pour the chicken with thickened stock. 3. Served with hainanese rice, ginger mixture, sweet soy sauce, light soy sauce & chili sauce.